This month’s featured Sleek i-Divine palettes are Sleek’s Ultra Mattes v1 and Sleek’s Original (US: E10). Both are discontinued, and both were LE. Bohemian is old enough that it had been discontinued for a while by the time I got my first Sleek palette. Featured colors this month are light green and light yellow. Since people perceive color differently, colors that are bluish-green may look more blue to some, more green to others. Colors that appear medium-dark may look more “medium” to one and more “dark” to another. Don’t be surprised if your idea of a “mediumish blue-green but more of a dark teal” is someone else’s “medium blue”! This is all about using things you haven’t used in a while, not about getting a global definition of what a color is. Some example products (all stuff I own, so…there are definitely others) include: Aromaleigh’s Italian Ice, Aromaleigh’s Acorn, BE’s Queen Phyllis, My Pretty Zombie’s Bear, Meow’s Turtle Bay, Shiro’s Enrichment Cetner, Shiro’s Forever A-Loan, Aromaleigh’s Gingko, Aromaleigh’s Dragonfly, BE’s Exotic Victoria, Color Club’s Le Petit Mint-seur, CND’s Sage Scarf, Femme’s Hallowed Ground, LaurEss’ Shangri La, Meow’s Mint Julep, NYX’s Horseradish eye pencil, Sally Hansen’s Jaded, and Shiro’s Matching Flower Crowns. 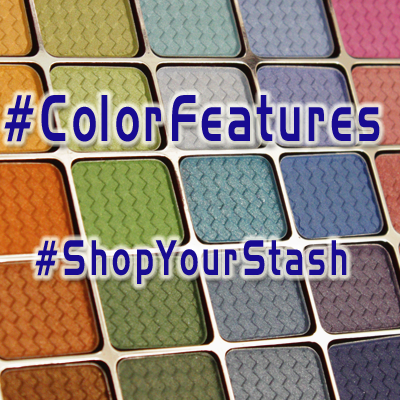 Color Features: Shop your Stash!